Week 16 playoff implications are now available at FiveThirtyEight. 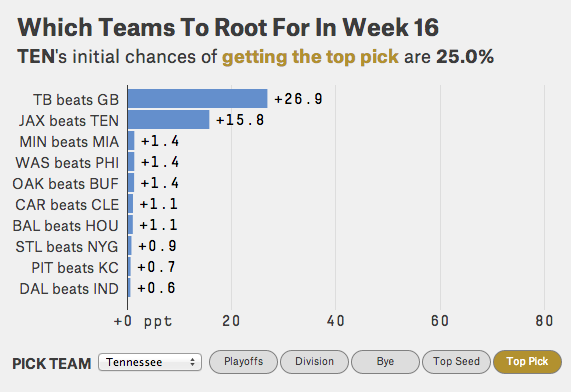 This week, the "best case" interactive has been upgraded with a "top pick" button, giving fans of the Buccaneers and the Titans something to do besides sob quietly. For determining draft order, the first tiebreaker is strength of schedule, which leads to some interesting implications for Tampa Bay and Tennessee. Their list of "rooting interest" games is extensive. UPDATE 2014-12-21: As now called out in the article, there was an error in the tiebreaker logic that led to incorrect probabilities for the top seed and bye week probabilities in the NFC. This has now been corrected. The programming error was 100% my own.